Plot58 | Green is the New Black. Dave Goulson, a bee expert at Sussex University, not involved in the research, hailed the findings as hugely significant. The tinfoil paranoia fallacy; everyone’s out to get us. If the poor chemical companies are feeling this persecuted just for earning an honest crust, imagine how the bees are feeling. They must surely appreciate the irony of a pro-pesticide sock puppet called the Crop Protection Association. The strategy of such groups is to discredit any opposition. Discredit the quality of any scientific findings. Discredit the methodology. Cast doubt, quibble and dismiss. Discredit the scientists involved for good measure. The real untainted science appears to be showing that neonics are indeed a serious problem to all insects, yet the industry sows seeds of confusion and obfuscation. Just enough to muddy the waters. Despite all these efforts, the industry’s scientific higher ground is under increasing assault from study after study that finds evidence of harm. The EU recently imposed a moratorium on neonic use – which is strongly opposed by the UK government. If the pesticide companies cannot get this overturned, no doubt they already have a neonic replacement lined up. Except this new improved product will be really really bee-friendly, and will no doubt feature pictures of happy bees on the label as proof of this fact. Whether neonics really are the prime reason for the demise of bee populations, or whether it is just one of many possible reasons, the wider problems caused by pesticide use should not be ignored, or glossed over with pseudo-science. It is simply another facet of our chemical warfare approach to farming; the genocide of the insect species. Insects are the evil enemy, and they must be vapourized. In conventional large-scale monoculture, bigger is better, and ever MOAR toxic chemicals are the answer to every problem. But what if it is the monoculture paradigm itself that is the problem? These pesticides are essential for a system that favours massive plantations of monocrops.The opposite of diversity. For all its economies of scale, the disadvantages of monoculture far outweigh the benefits. Such an unnatural environment is neither balanced, nor resilient enough to survive without constant medication and intervention. There are easier ways to farm, without pesticides. Fortunately, this would look nothing like the monoculture we have today. 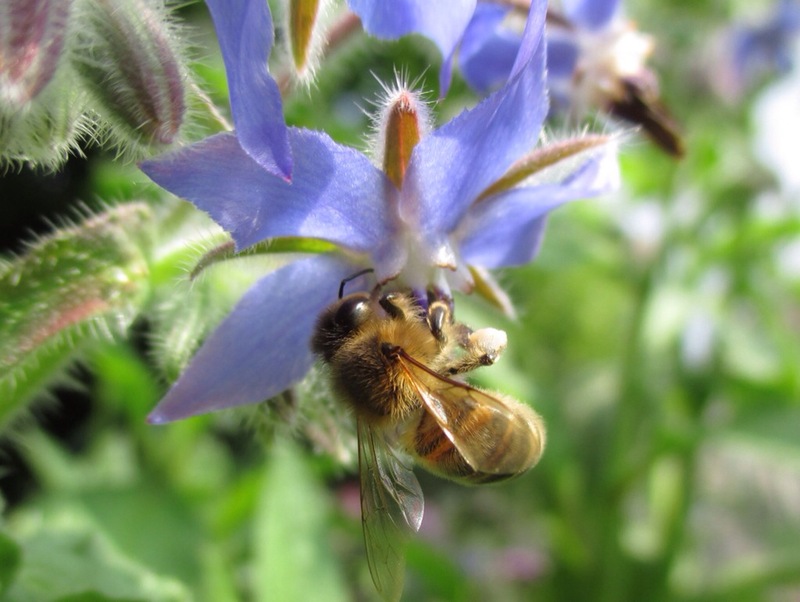 All that’s needed are more farmers – and if you want to save the bees, don’t forget to plant some borage. Part 2 of the Big Allotment Rant concerns the modern scourge of every allotment site. Millions of years from now, when future species discover our fossilised remains, they will probably find us buried beneath a thick layer of plastic. Or maybe there will be no future species, as plastic is fast becoming a serious threat to all life. In just 100 years, this miraculous material has permeated every aspect of hunan civiisation, and assumed every form and function imaginable. We wear it, we drink from it, we wrap our food in it. Some of us cover our plots with it, as sheeting, nets, old carpets, frames, and even the odd tyre. It is everywhere. It’s cheap and thoroughly disposable. And that is where the problems start. As everybody knows, plastic is not bio-degradable. Instead it is broken down by the elements into ever smaller particles of plastic. Not to mention the toxic constituent chemicals such as phthalates, DEHP, and Bisphenol-A that are deposited into the water and soil – and into our bodies. Numerous studies have found that BPA can adversely affect fetal development, disrupt the endocrine system, alter DNA and brain function, cause hyperactivity and arrhythmia, and reduce sperm count. BPA has been found to leach into bottled water at warm temperatures, and into food especially during microwave cooking. With the growing awareness of the dangers of BPA, the packaging companies are now heavily promoting “BPA-free” produts, but these still contain other harmful plasticizers. These dangers seem to have been largely overlooked, however, as the sheer convenience of plastic has seduced us into unthinking acceptance. Yet every single bag and bottle we have discarded is still very much with us. 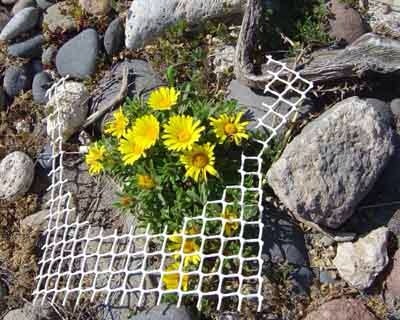 Every inch of nylon twine, every seed packet thrown away remains in the environment. You will find this debris in the manure that is delivered to site, and increasingly you will find fragments of it in your soil. A tiny piece from next-door’s mulch sheet that has been ripped to shreds by the wind here, a fragment of net there. Pretty soon it starts to add up. The oceans are already full of it. At least 100 million tonnes of plastic has ended up in the world’s oceans. Millions of tonnes of which are regularly regurgitated onto previously pristine beaches. Plastic debris is the single greatest threat to marine mammals today. The Great Pacific Garbage Patch is a giant toxic soup, often containing 60 times more plastic than plankton. A recent study carried out by scientists at Plymouth University found that One-third of fish caught off the south-west coast of England have traces of plastic contamination. World plastic consumption is estimated to hit 300 million tonnes this year. Most of it will be immediately discarded. You might experience a wrap rage incident with an impenetrable (and implausibly outsized) polycarbonate casing that resists all efforts to prise it open, short of frenzied violence. You might often wonder why every vegetable under the sun needs layer upon layer of plastic trays and wrappers, when they already come with their own natural wrappers. This excessive and largely unnecessary plastic packaging is one of the most damning legacies of our age. We are the reason for such colossal and unthinking waste. We demand protective packaging for everything. We can admire the beauty of an unspoilt natural spot one minute, then casually dump our plastic rubbish on it as we leave. Or we may not think anything of covering our plot with an old carpet. Quite why anyone would place old tyres on their plot is a mystery, however, but it still happens. The plastic problem is now so bad that more and more allotment associations are explicitly banning certain materials from site altogether. Among the young people who come to these mountain huts, there are those, poor in body and spirit, who have given up all hope. I am only an old farmer who grieves that he cannot even provide them with a pair of sandals – but there is still one-thing I can give them. One straw. “With the destruction of mankind at hand, you can still hope to cling to a straw?” one youth asked, with a touch of bitterness in his voice. This straw appears small and light, and most people do not know how really weighty it is. If people knew the true value of this straw a human revolution could occur which would become powerful enough to move the country and the world. Unlike plastics, at least straw rots down quickly and enriches the soil. It is also a far superior mulch, and probably far cheaper per square metre. Which would you rather see blown onto your plot? David’s Epic Rant about the awful allotment challenge show was spot on. Such programmes probably inspire people to live out the bucolic lifestyle, ignorant of the hard work and skills required. These telly visions, edited in soft focus with a jaunty Vivaldi soundtrack, are promptly eviscerated by the harsh reality that is the English climate. Turnover of plotholders is high as a result; not because there is anything intrinsically difficult about growing an abundance of food on a few rods of dirt, but because many are not well equipped for the task. Plastic is such a pernicious part of the allotment landscape these days that it deserves its own dedicated and detailed rant, but first a heartfelt declamation on herbicides, pesticides and other chemical weapons of mass destruction. The primary villain of this peace is glyphosate, the active ingredient in Roundup, because it is so ubiquitous, but it applies to any weapons deployed against nature in the growing of food. There are sadly too many to mention. Neonicotinoids deserve a special mention for their role in the collapse of beneficial pollinator populations, and they are now being banned in many countries. There is a growing body of evidence on the deleterious effects of these chemicals. The World Health Organisation’s cancer research agency recently concluded that Glyphosate was ‘probably’ carcinogenic. The weedkiller has been detected in food, water and in the air after it has been sprayed. It turns out that Monsanto Knew of Glyphosate / Cancer Link 35 Years Ago. Despite that, Monsanto appear very upset that the WHO has deviated from the agreed script about safety. Another study recently found that Roundup Herbicide Causes Antibiotic Resistance in Bacteria. Perhaps most disturbingly, a senior research scientist at MIT has claimed that Half of All Children Will Be Autistic by 2025, and that evidence points to glyphosate toxicity from the overuse of Monsanto’s Roundup herbicide on our food. she noted that the side effects of autism closely mimic those of glyphosate toxicity, and presented data showing a remarkably consistent correlation between the use of Roundup on crops (and the creation of Roundup-ready GMO crop seeds) with rising rates of autism. Children with autism have biomarkers indicative of excessive glyphosate, including zinc and iron deficiency, low serum sulfate, seizures, and mitochondrial disorder. Humans, for all their technological advances, have not yet evolved the ability to consume petrochemicals safely. This might even explain the increase in new health problems in recent years. Yet another study finds that glyphosate inhibits natural detoxification in human cells. By inhibiting the body’s gut flora from performing its essential function in the human body,glyphosate heightens many health issues facing the Western world today. These conditions include inflammatory bowel diseases, Crohn’s disease, obesity, and even dementia and depression. Also, by restricting gut bacteria from absorbing nutrients, glyphosate voids the body of essential life-giving vitamins. Dramatic Correlation Shown Between GMOs And 22 Diseases. Of course, the chemical weapon manufacturers vehemently deny all of these findings. They tend to carry out their own research, which consistently finds nothing to be concerned about. A lobbyist recently claimed that glyphosate was even safe enough to drink – until offered a glass, that is. The acute toxicity of glyphosate is claimed to be very low. But by design it disrupts functions of enzymes, and the long term effects of bioaccumulation are not well understood. Even if you believe that glyphosate itself is relatively harmless, some of the products with which it is mixed are a different story. Marketed formulations of glyphosate generally contain a surfactant. The purpose of this is to prevent the chemical from forming into droplets and rolling off leaves which are sprayed. Some of these surfactants are serious irritants, toxic to fish, and can themselves contain contaminants which are carcinogenic to humans. When i was handed the keys to my first plot in 2008, the Site President offered to Roundup the weeds (ie, the whole plot) for me. I was shocked that this was being freely offered for a plot where I was expected to grow food. To me, those nettles were a sign of soil fertility; to another they might represent an unwanted intruder, to be terminated with extreme chemical prejudice. For all I knew, that plot could have been sprayed with glyphosate for years if this complacency was the prevailing view. Even if you are committed to chemical-free gardening what is there to stop your neighbour from deciding that a good dousing of Roundup is just the ticket for his terrible weed problem – sure beats doing it manually, saves a lot of time, what’s not to like. As long as he does it safely. Unfortunately, these chemicals tend to drift; if you are using them on your plot you cannot guarantee they will stay on your plot. Even on a still day. Plants are innocent. They are all doing a job, and expressing that job to the best of their abilities. To see a patch of thistle is to see a disturbance, and it’s being mended fast. If you put a thistle under an apple tree, you can call it a glove artichoke, right? You see, the soil under that artichoke will be twice as good and thick with worms compared to soil without the artichoke. So, it’s a soil mender. If you have a weed problem there are easier ways to deal with it than chemical warfare. But that would involve us not looking upon nature as an unruly and intractable enemy that must be roundly defeated on all fronts just so we can better impose our own rules, aesthetics and geometries upon it. It would require us to collaborate with nature rather than to wage war on it. We are advised to Ignore deflation fears, and make the most of the extra pounds in our pocket, presumably by driving somewhere to buy loads of stuff on credit. This onset of deflation has been largely attributed to the falling oil price. According to politicians, deflation has absolutely nothing to do with QE, excessive debt, peak oil or demand destruction, and it will be a very brief and contained phenomenon. In the 70’s we had stagflation, now we have joyflation: the combination of the oil-driven slowdown in inflation and accelerating economic growth. As the Spanish finance minister put it recently, “deflation is like cholesterol”. Yes, that is a genuine quote. You see, there is good deflation, and there is bad deflation. And Spain is, of course, suffering exclusively from the good kind of economic cholesterol. Because of the falling oil price, which acts like a probiotic elixir that magically boosts the monetary metabolism of sclerotic spanish consumers everywhere. All glibness aside, no amount of joyflation will stimulate growth when you are also gorging on too much sugary processed debt, like a bankrupt bulimic. Spain’s govt debt to GDP is set to top 100% any day now. Whilst not as corpulent as some, it is still morbid economic obesity. Since painflation only happens in the benighted, less deserving elsewhere, we would do well to heed the exhortations from learned economists to spend this tax cut so generously granted by oil exporting countries. If the wild girations of recent years are anything to go by, the oil price won’t stay very low for very long. 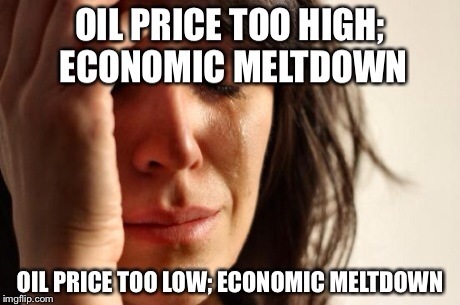 But is the oil price really the cause of all this joyous flation, or simply another symptom of a much deeper malaise? One thing is for sure; when deflation can be so insouciantly reclassified, redefined and denied, then it must be serious. New legislation to allow member states to restrict or ban the cultivation of GMO crops was passed earlier this month. 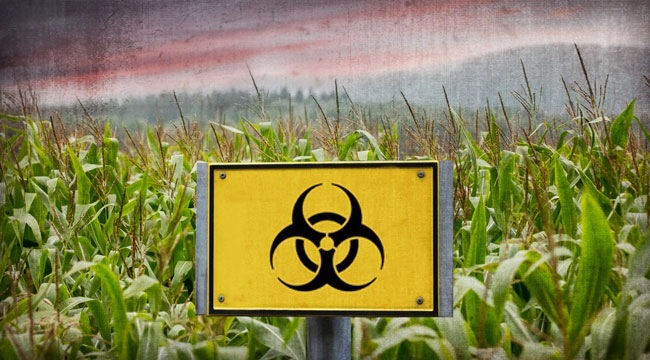 Before a member state may adopt such measures, the legislation provides for a procedure enabling the GMO crop company to consent to such restrictions on its marketing authorisation. However, if the company disagrees, the member state may impose a ban unilaterally. How many GMO companies are likely to consent to any restrictions on their unfettered expansion into the European market? The process is riddled with loopholes and can be challenged in a number of ways. In addition, the Directive only relates to GMO cultivation – and not to GMOs in products, their transport or research. This is a huge victory for the GMO giants, and we can expect to see a rapid introduction of crops as soon as this spring. The UK, as one of the staunchest advocates for this rule change, is expected to lead the way on cultivation. Another survey has shown that only 21% of the UK public support GMO. If public support is so low, why is the government so determined to press on with cultivation regardless? The incremental introduction of GMO has gone largely undetected, but it is now at a point where none of the major supermarket chains can guarantee that their meat livestock are GMO feed-free. The safety of using GMOs in food production is now of real concern as a growing number of published scientific studies are finding a range of serious health impacts from GMO consumption on animals. These include lesions in the gut, damage to body organs, unexplained deaths, and stunted growth in the young of animals reared on GMOs. This means that there are important animal health and welfare concerns over the use of GM feed; there are also concerns about possible long-term effects on people. Given these concerns, it is understandable that the public supports the clear labelling of GMO product, and food derived from GMO feed, yet the Soil Association found that most farmers themselves weren’t sure whether their feed was GMO or not. If you are unable to make an informed decision as to the provenance of your food, then what choice do you really have? Recent attempts to introduce GMO labelling in the US were met with stiff resistance from the industry. The big biotech companies excused their refusal to label by claiming that it would be too costly, and cause too much confusion for sonsumers. Those consumers who recall BSE, and the myriad other food and livestock scandals of recent decades, might argue that it would be far costlier in the long run to iignore the risks and to plough on with widescale cultivation. Ever since Karel Capek coined the word in 1920, humans have been fascinated by robots; by their endless possibilities, as much as by our nagging fear that they might one day turn against us. Robot was derived from the Czech word for drudgery, serfdom, or forced labour. In Capek’s play R.U.R. the robots rebelled, and killed all the humans. If popular culture since then has taught us anything, it is that someday mankind must face and destroy the growing robot menace. So when a recent Guardian headline declared that Robot farmers are the future of agriculture, it conjured up images of pristine and highly-productive plots lovingly tended by super intelligent machines that never tire, twinge or ache from their extended toils. The government is committing £160M over 5 years to the agri-tech industry, to develop new technologies in order to achieve a “sustainable intensification” of agriculture in the face of these global challenges. It is an ambitious proposal that seeks to transform the way that food is grown in the future. But it assumes that the only way to deal with the food production challenges of the future is with more science, more technology, more automation, and more genetic manipulation. The current agri-tech landscape is already a desert of monoculture, large scale arable enterprises, and concentrated animal feeding operations. To suggest that the answer to the problems is more of the same may be missing the wood for the trees. In energy input.terms alone, sustainable intensification is verging on the oxymoronic. This is the kind of logic that spins the chemical extinction of bees as an exciting commercial opportunity because, y’know, we could just invent some drone insects to replace them as pollinators. Sure, wIth increased automation and processing power, even the dullest and most repetitive tasks can be delegated to machines. But if soils are already depleted because of excessive chemical inputs, and eroding at a rapid rate, any further intensification of production could prove challenging at best. The implications for human employment in this brave new agri-tech world could also be dire. 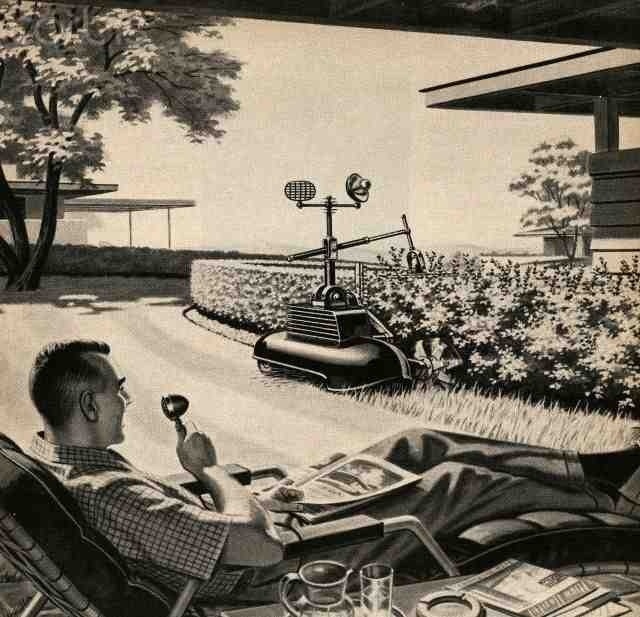 Despite all this I’m still hopeful that, when the iFarmbot 3000 is launched in 2050, we will finally be able to sit back, relax, and enjoy the beautifully synthetic bio-engineered allotments, without having to worry about being hunted down and terminated by the ruthless inspection bots.